I’ve been spending the best years of my life as a public benefactor. There’s not much to like about Texas. I spent a couple of years living there while I was in the military. Austin has a few good restaurants, and I hear the town now is sort of an artistic Mecca for musicians. Outside of that, Texas seems to be a mean place where a nasty anti-intellectualism resides and a lot of bad things happen. What I’ve learned recently about the proposed gas pipeline through the “protected” New Jersey pinelands suggests a Texas corporation is at the root of the problem. No surprise; Texas meanness extends well beyond its borders. The B.L. England Generating Station at Beesley’s Point, NJ. Picture taken May 2007 just after it was acquired from Atlantic City Electric by Rockland Capital. After seeing a couple of New Jersey Pinelands Commission meetings, talking to folks and reading news stories, the whole pipeline scheme looks to be largely for the benefit of this Texas Corporation. Rockland Capital Cape May Holdings, LLC is affiliated with (local muscle for?) Rockland Capital Energy Investments, LLC of Houston, Texas. “RC,” as they call themselves, bought the declining B.L. England Generating Station in 2007 for $12 million, round numbers. 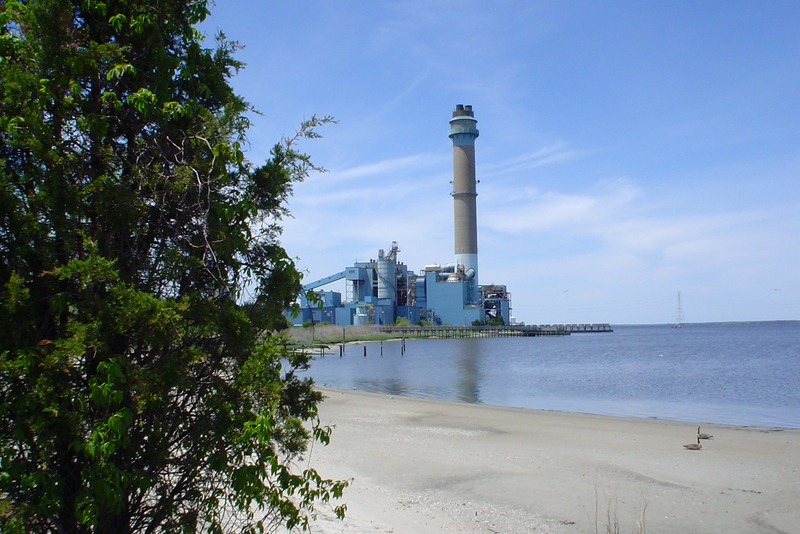 What they got was 368 acres of prime land on the mouth of the Great Egg Harbor River and an electrical generating plant rated at over 400 megawatts. Two of the generators are coal-fired; the other uses No. 6 fuel oil. Only one of them has a “scrubber” unit to clean the exhaust gasses. None of the units seem to meet latest air pollution emission standards to operate regularly. What has been said at Pinelands Commission meeting is the power plant operates only during periods of peak demand – summertime at the Jersey shore when the air conditioners are blowing gale force day and night. A lot of people go to the Jersey shore in summer. They say they love it – but not enough to tolerate the heat and humidity (all that water around, don’t you know!). So, there’s lots of air conditioning and electricity use. Rockland Capital was not created to provide cool air to Jersey shore vacationers. They are an investment company. Profit, making money, that’s what they care about. Their stated strategy is this: “Rockland’s investment philosophy is value based and acquisitions are expected to yield competitive risk-adjusted returns. Primary acquisition targets are power generation and related assets with unique commercial, financial or physical characteristics that can benefit from an active management approach. Investments are considered on a selective basis and include: merchant generation and distressed assets.” They list a few other type investment “targets,” but those two appear to define the B.L. England acquisition. They characterize it as a merchant generation facility (wholesale, unregulated sale of electrical power), but it would seem hard to get much return on investment if you can only operate one 155-MW unit a few months of the year. 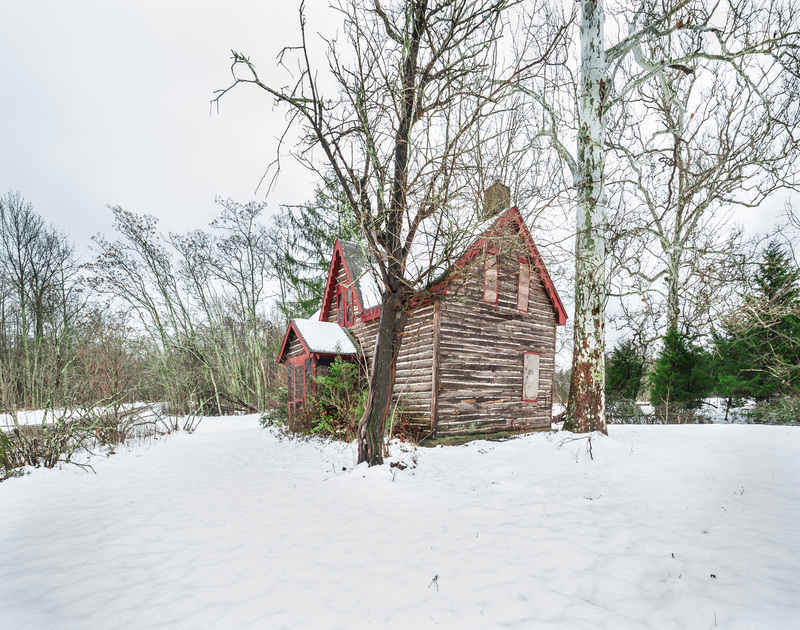 That would seem to suggest it’s a distressed asset, a fixer-upper. On the plus side, if you could convert the facility to burn gas, it could operate at optimal output year-round. Also, given that the Oyster Creek nuclear generating station will close in a few years, the market would be more favorable for a gas-fired producer. It might put such a plant in a very profitable position. And profit is everything for a Texas company called RC. 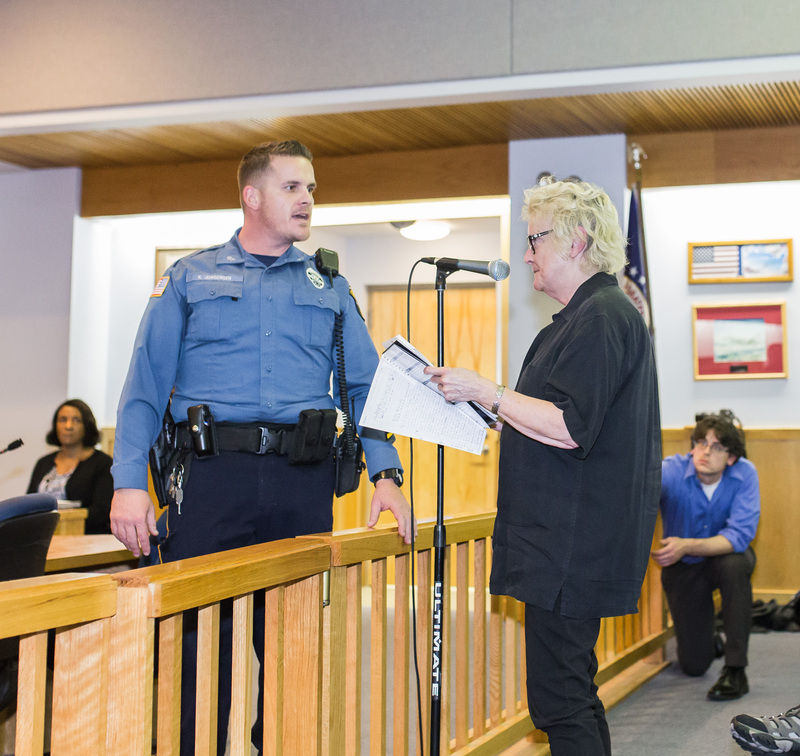 Galloway Township Officer Jorgensen appears furious when Anne Carroll of Collingswood refuses to stop speaking after her three-minutes was up. The threat of arrest from armed officers does not comport with my idea of participatory democracy. Thanks (?) to fracking (hydraulic fracturing of deep geological formations to harvest gas) this country is now fuming over with hydrocarbon gas. If I remember right, about 40% of what we’re now “producing” is being exported to other countries. If only there was a way for that B.L. England plant to convert to gas and get it piped into their facility. There is no nearby gas supply they can hook into. So, South Jersey Gas to the rescue. To sell as much gas as an electrical power generating station will use, they’ll gladly build a pipeline right to their door. South Jersey Gas says: “Once online, the annual throughput of gas to the B. L. England facility will be about 20 million dekatherms, essentially equal to the amount of gas SJG currently provides to approximately 267,000 homes in a year.” The instant equivalent of a quarter-million new customers. I might pick up a shovel and start digging a pipeline myself for that kind of business. Trouble is, South Jersey Gas and RC have a little problem. 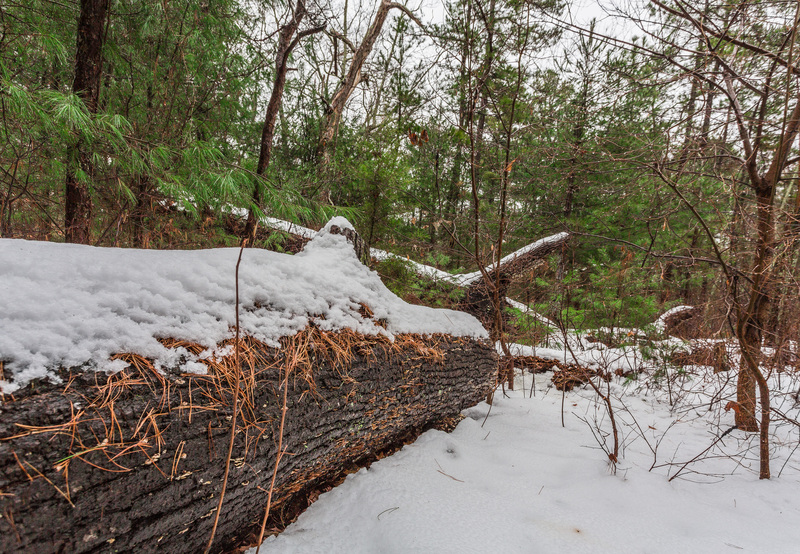 NJ pinelands in winter. Most folks don’t associate this kind of beauty with New Jersey. 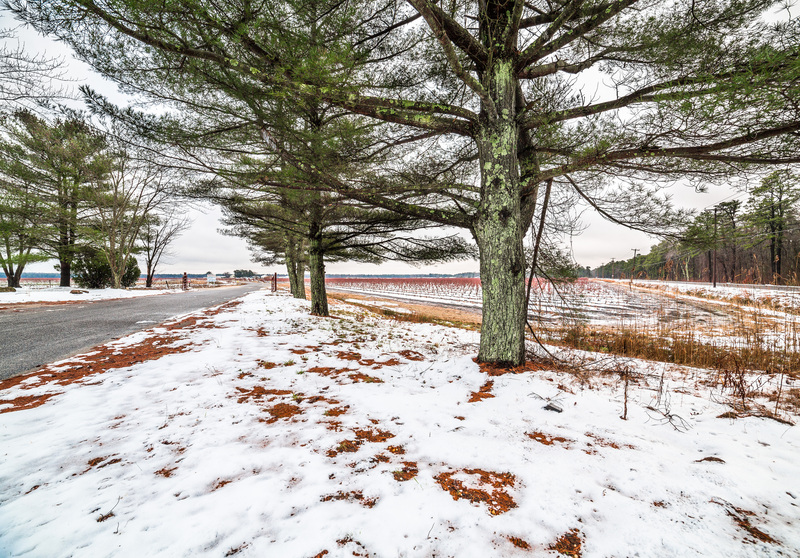 Using the most convenient route for a pipeline, the environmentally protected New Jersey Pinelands National Reserve stands between the place where you get the gas and the B.L England plant where they want it to go. 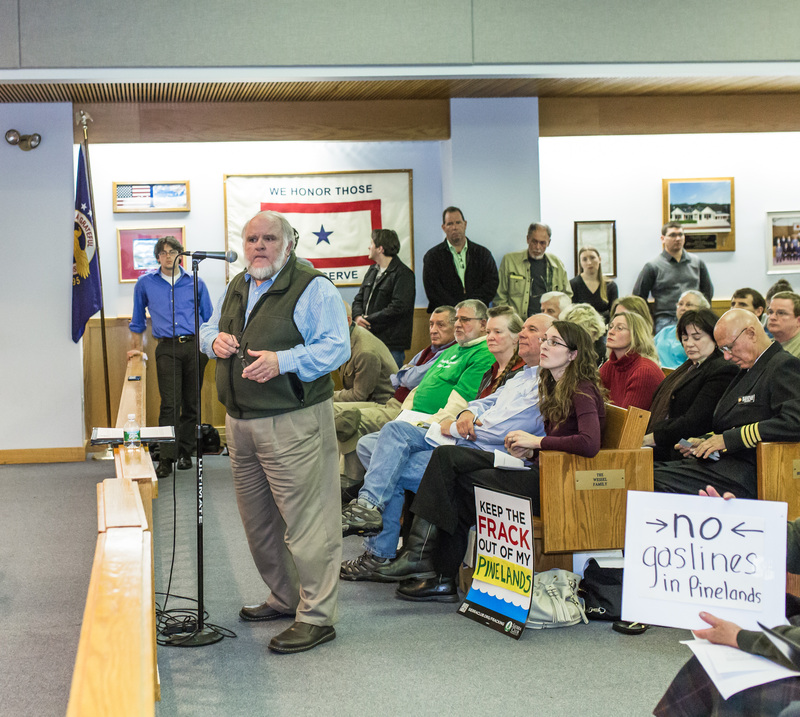 You’re not allowed to run a high-pressure, hydrocarbon gas pipeline through the pinelands. 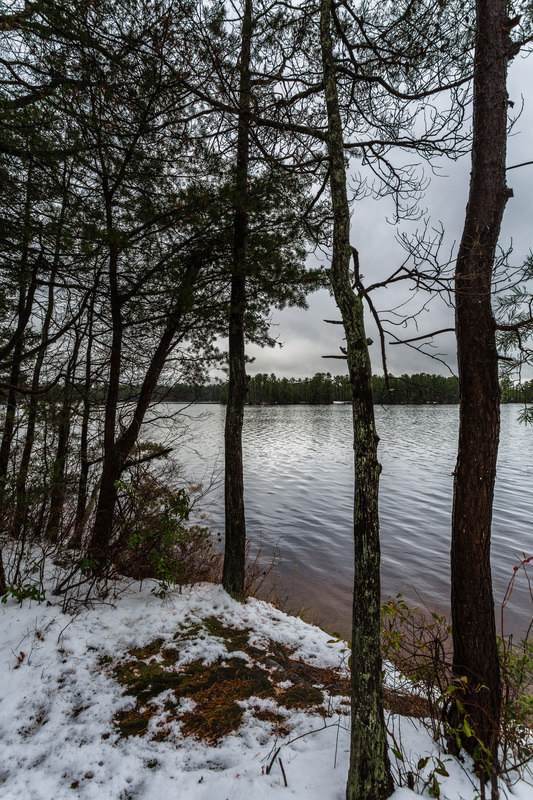 Over 30 years ago the federal government, New Jersey state government and even the United Nations said our pinelands are too special and need to be protected and preserved for all time. Laws were put in place to protect that land. South Jersey Gas and RC seem to think those government entities were just kidding. Either that or they believe they are more special than the pinelands themselves. Maybe both. So, instead of using a more expensive route for their pipeline, they decided to get around the laws. To do this, they’re using what appear to be bribes and corrupt politics. Since the pipeline clearly violates the pinelands protections, South Jersey Gas didn’t bother to seek permission from the New Jersey Pinelands Commission, the governmental group charged with enforcing the preservation directives put into place over 30 years ago. That would have been rejected out of hand. Since most folks seem to think this Commission has been too tough in their enforcement over those years, it’s not likely they’re going to buy off. But hydrocarbon energy has always generated lots of dirty money and there are dirty politicians who like that dirty money. The right ones may be able to pressure the Commission to dance to the tune of RC from Texas, the investment company that needs the gas. Step one for South Jersey Gas was to ask their pals at the New Jersey Board of Public Utilities, the regulating agency in the state, to use their muscle and directly ask the Pineland Commission to allow the pipeline. Government entities can sometimes get variances for works of public good, such as expanding an airport or accommodating needed highways. The notorious gangster, Al Capone, said, “I’ve been spending the best years of my life as a public benefactor.” South Jersey Gas and RC must see themselves in that same warped mirror. Standing room only at the Pinelands Commission meeting in Galloway Township, December 9, 2013. When some Commissioners started voicing public doubts about the whole deal, the Governor sent a message. He had his attorney general tell one of the Commissioners he had a conflict of interest, therefore he was not allowed to vote on the pipeline. 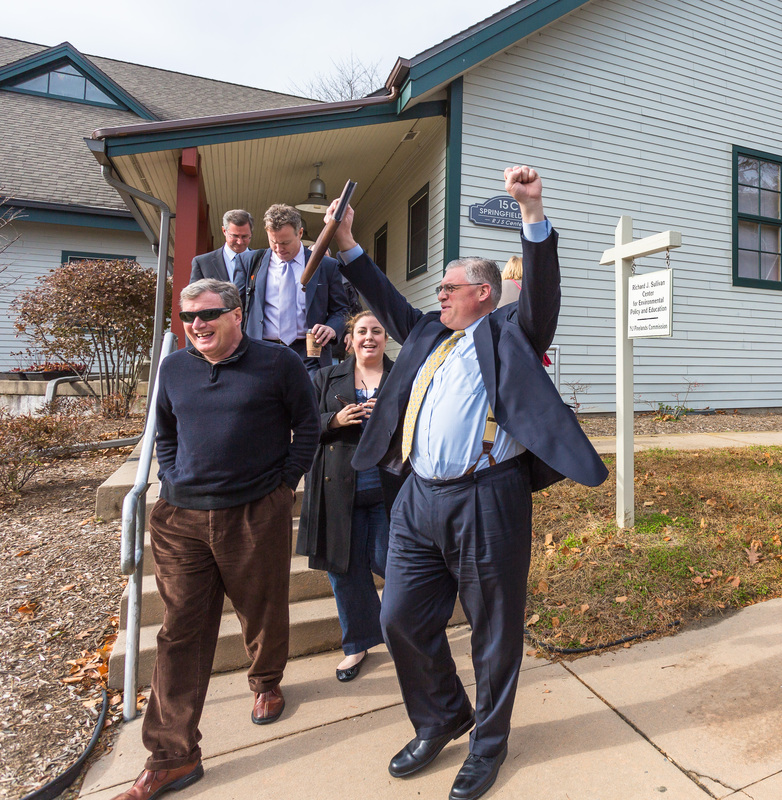 This Commissioner is affiliated with an environmental group that may or may not have asked the Commission to schedule more time and meeting for public comment – that’s his “conflict of interest.” At the next public meeting, goons from the attorney general office showed up to make sure this Commissioner had nothing to say about the issue. The NJ Governor has his head in the fantasy clouds of running for U.S. president in 2016, and I’ll bet a sizable campaign contribution from a Texas corporation would be very helpful – just speculation, but hydrocarbon money is as dirty as it comes. Logs, not pipelines in the New Jersey pinelands, please. In answer to the current Governor’s message, four past New Jersey Governors have sent their own message. They are telling the Commission not to mess with the pinelands. Brendan T. Byrne (a State Forest in the pines is named for him), James Florio, Thomas H. Kean and Christine Todd Whitman sent a letter to the Commission saying, “The current proposal would compromise the integrity of the Pinelands plan and serve to encourage future development contrary to the vision the plan sets out for growth and conservation in the Pinelands.” This is what I and many environmental groups have been saying. On Friday, January 10, 2014, we play the next round in this Texas tea drama. The Commissioners may vote that day to approve or reject the pipeline. If approved, environmental groups have promised a challenge in the courts. That could prove an interesting and possibly long, drawn-out affair; RC and their South Jersey Gas puppets won’t like that. Blueberry fields in the NJ pinelands. The plant thrives in the unique highly acidic soil. While a lot of my environmental friends will disagree, I don’t oppose a gas pipeline to this generating plant. Actually, it seems like a good use of existing infrastructure. We’re going to need generating capacity. (Wind, solar, etc. are better, but they are not the near-term solution.) If the B.L. England plant can be converted to gas, that does seem to be a reasonable near-term solution. However, I believe their pipeline through the piney woods carries too much potential for all sorts of future ills. Let’s tell Texas to spend the money and build this damn pipeline someplace where we don’t compromise our pinelands and our cherished values. Either that or we sic the Jersey Devil on them! I love your writings normally… But it appears as though you anger blinds you to fact. Buy fact I do not mean your content relating to the pipe line etc. I mean you disrespect for people of another geographic region, you use words like mean and the you follow it by saying anti-intellectualism . What is this about a lot of bad things happening in Texas? False, you state leads way more list then Texas sir. Well, Christie visits Dallas Cowboy owners at games, who is a gas industry guy. In the DNA of deregulation, Enron and Texas gas industry pushed for Energy Policy Act of 1992 under first President Bush, and subsequently lobbying for individual State deregulation, I believe California was one of first and utilities gave up wholesale power plant monopoly in return for $28 billion in stranded assets. ENRON CA market manipulation and Texas.El Paso wholesale pipeline problem results in California eleectriciry crisis with $100 billion level of stockholder, rate payer, tax payer and economic damage. Gas Industry manipulated FERC under 2nd President Bush from Texas (Chairman of FERC from Texas) with with independent power producers to conditions favorable promoting and approving new gas pipelines and combined cycles even before fracked gas boom in PA. PA fracked gas industry is really just an extension of Texas gas industry interests. NJ went thru similar deregulation to California and stranded asset costs just recently paid off. With both FERC giving oks to Penn East interstate fracked gas to NJ (owned by NJ gas companies which also has PA fracked gas interests). Christie Adminstration promote gas strategy in 2011 Energy Master Plan and both SJ Gas (BL England) and NJ Gas (probably gas repowering Oyster Creek) promoted both the combined cycle projects and associated gas pipelines. NJ BPU President Rick Mroz founded NJ Energy Coalition that had a strong influence on 2011 Energy Master Plan gas strategy, and now as NJ BPU President was in position to update the master play fsvorable to gas (ignoring public comment) and in approvals associated with both SjJ Gas and NJ Gas pipelines that NJ BPU has been promoting with srrong encouragrment of NJ Energy Coalition. He was appointed to NJ BPU to take place.of Lee Solomon to facilitate NJ gas strategy while Christie still in office and Chief of Staff is former SJ Gas executive also with ties to NJ Energy Coalition. Im not sure if your blog note that Samson the former NYPA excutive in Bridgegate and United scandals, and Christe appointee, law firm reprsents Rockland Energy interests. Im tokd NYPA Police Association made donation to Cape May County Democrats whose treasurer was later appointed to Pinelands Commission. It would be awful if somehow Cruz of Texas gas industry interests and Christie end up as Republicans Presidental and Vice President combo.